New bamboo shoots coming out of the ground will turn into the new culms of bamboo plants provided you do not harvest the shoots for a food source. If you have just one or two bamboo in your garden for ornamental purposes you are not likely to want to harvest your new shoots for food because you will not have so many new culms from the plant if you do that. If on the other hand you are growing a larger number of plants that are an edible bamboo species, on a domestic or commercial level, that means you will have enough shoots to be able to eat some of them without it being detrimental to the growth and spread of your plant, this is a cool way to get some additional use from your bamboo. For example, if you are looking for bamboo plants to create a hedge, you could consider a suitable species that is also going to produce edible shoots. Harvesting and eating your bamboo shoots will have the additional benefit of helping to control the spread of running species if they go off in the wrong direction as one of the ways to control the spread of bamboo is to chop off the shoots. If you are going to have to chop off the shoots to control the plant why not plant a species that is an edible bamboo and you can also eat the shoots! The fresh new shoots of some bamboo species are edible and are often harvested and used across the world as an ingredient. 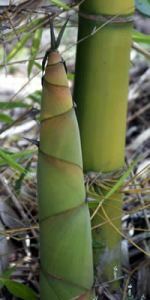 If you are not growing your own, these edible bamboo shoots can be purchased as fresh produce, canned, or pickled, and are often for sale in supermarkets. For using edible bamboo species in recipes you can slice them, boil them, cook them in coconut milk with spices and a mixture of vegetables, steam them or fry them. aid prevention of constipation, assist in reduction of LDL cholesterol, and help with weight loss due to being low in calories, eliminate internal worms, and aid in prevention of high blood pressure. A new bamboo shoot is amazing to watch grow day by day. They appear out of the ground and within no time at all are reaching for the sky at an incredible rate. I love to see the new shoots come up and it is often the first thing I check out when I go outside in the morning, keeping my eye out for any new ones appearing since the day before. 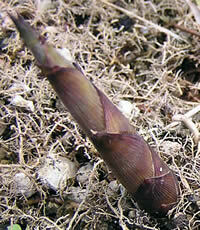 These new shoots are what will turn into the new culms of your bamboo. They generally seem to appear at the thickness the mature culm will be and the new culms can often be a different colour to that of the mature plant, Black Bamboo and Golden Bamboo are two good examples of this change in culm colour. Juvenile plants, even if they will eventually have culms that are wide when they are mature after a few years growth, will produce thin shoots and culms. Once the plant is established and as it matures year by year the shoots will be larger and result in a wider diameter of the culms. As your plant matures you can take out the previous and juvenile year’s culms to leave the mature ones. This is part of the care and maintenance of your bamboo plants and will show off the culms along with removal of the lower branches and general tidying up of the plant once a year.